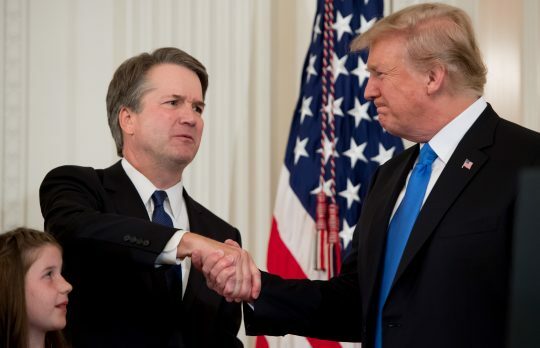 President Donald Trump tweeted for the first time about the controversy surrounding sexual assault allegations against Supreme Court nominee Brett Kavanaugh, saying Friday the judge was "under assault by radical left wing politicians." Trump didn't directly address the charge made by Christine Blasey Ford that Kavanaugh drunkenly pinned her down and groped her at a high school party in the early 1980s, which Kavanaugh has denied. "Judge Brett Kavanaugh is a fine man, with an impeccable reputation, who is under assault by radical left wing politicians who don’t want to know the answers, they just want to destroy and delay," he tweeted. "Facts don’t matter. I go through this with them every single day in D.C."
He added a few minutes later that he felt Ford would have filed charges "immediately" with "local Law Enforcement Authorities" had the attack been "as bad as she says." Trump has publicly defended Kavanaugh as a man of high character since Ford revealed herself as Kavanaugh's accuser publicly, following the leak to the press of a letter she sent to California Sen. Dianne Feinstein (D.) in July about the alleged attack. Trump blasted Feinstein in remarks at the White House this week for not bringing up the accusation earlier in the confirmation process. Feinstein didn't reveal the letter to her colleagues on the committee until last week, drawing a rebuke from chairman Chuck Grassley (R., Iowa). Trump told Fox News host Sean Hannity on Thursday that Ford should "have her say" and then "let's see how it all works out." He also asked "why didn't somebody call the FBI 36 years ago," although this would have been a local crime matter for police to investigate. Kavanaugh has said he wishes to testify in front of the Senate Judiciary Committee to clear his name. Ford's attorney is in negotiations with the committee over whether she will testify; she has requested a FBI investigation of the charge before she does and also said testifying on Monday is not possible. UPDATE: 9:19 A.M.: This article was updated with another tweet from Trump about the assault allegation. This entry was posted in Politics and tagged Brett Kavanaugh, Dianne Feinstein, Donald Trump, Supreme Court. Bookmark the permalink.